WordPress for Everyone: What is It & How Do I Get Started? Free speech on the internet is available for the taking today. The tool that empowers this people’s revolution is called WordPress. If you can write and operate a computer, you can publish your own WordPress site: a website that can be anything you like! If you have wanted more than a social media page, but you have had no idea how to move forward with that need, then WordPress is for you, and so is this article. 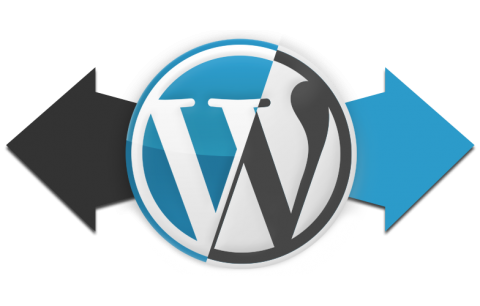 WordPress is a free software package that enables any web user who can operate a few simple browser screens to publish his or her own website. This means: no web designer necessary. No HTML or programming guru needed. No major technical knowledge required. No expensive, slow piece of software installed to your desktop or laptop computer necessary. WordPress is lightweight — all you need is WordPress, a website hosting account, and a computer with internet access. All that you need to work with WordPress is the computer that you use to update your WordPress site, a web browser like Chrome, Firefox or Internet Explorer, and an internet connection. You must first log into your WordPress-based website with a username and password in order to make changes or additions to your content. 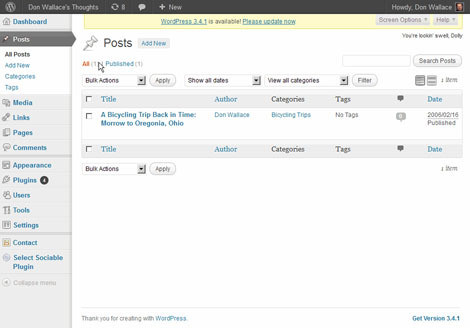 Logging in gives you access to the WordPress Dashboard. The Dashboard provides a way for you to create stories or pages, edit your existing content, interact with users who may have posted comments to your stories or your pages, and make changes to the structure and appearance of your site itself. But let’s not get ahead of ourselves. First, you have to “get” WordPress. And you need to spend a little time setting things up. Let’s discuss how all that works briefly, next. How to Get Started: WordPress.com or WordPress.org? You can also use a web hosting company that does not provide “one click install” of WordPress. This only recommended for those who are tech-savvy about Linux, FTP, PHP, MySQL, and all of that other highly entertaining web technology stuff. A starting author or site owner may wish to acquire their own unique domain name that can be assigned to your WordPress site. WordPress.com offers a premium hosting service that includes this option (see the site for details.) With a commercial web host, you will either purchase the domain name through the host service itself, or from a domain registrar. We don’t have the space in this article to cover that process, but it is readily available to you. Just ask your web host. Don Wallace is principal of The Software Copywriter, providing marketing services for software, cloud, and IT product and service businesses. Don has a Bachelor’s of Electrical Engineering degree from the University of Dayton. He has been self-employed as an expert contract software developer in the areas of C++,Windows and Linux since 1993 and has worked with a wide array of entrepreneurial and start-up software product businesses. He enjoys using a lifetime of technology and business experience to communicate ideas and concepts. Find out more at www.softwarecopywriter.com.